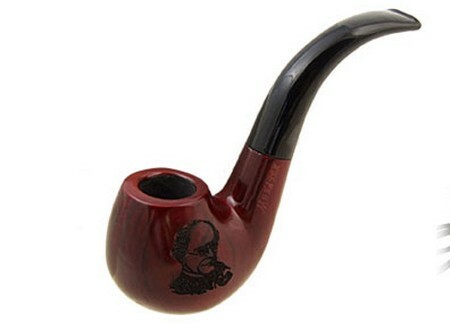 If you love to smell and smoke a pipe them making a pipe by hand would be a great project for you. It’s a fairly easy task and all you need is a hand held Dremel tool, a pipe kit, some carnauba wax and sandpaper. Here is how you can make a wooden pipe. It takes as little as an afternoon. Continue reading to find out how. You’ll need to buy a Briar pipe kit to make your own smoking pipe. These are available in various styles and shapes from pipe makers and tobacco pipe retailers like American Smoking Pipe Company. These pipe kits come with a fitter pipe stem and all the necessary holes pre drilled into the pipe. You’ll have to shape the pipe yourself. Use a pencil or marker to draw around the pipe patter you chose to use onto the briar block. This will be a template for you. It will show you what you have to remove. Use a band saw to cut your pattern if you can. Doing this will save time in terms of using the Dremel tool. Begin to sand away the briar according to your template with the Dremel tool. Don’t make the walls of the body of your pipe too thin. The tobacco can burn through that way. As you use the pipe a film called “cake” will develop. You should scrape this away to the width of a dime. Use the Dremel to shape the pipe. When it is 80% complete stop. The final part will be done by hand. Use a 320 grit sheet of sandpaper to go on shaping the pipe. After the pipe is 90% done begin to sand with 500-grit sandpaper. The final part should be sanded with 800-grit sandpaper. Stain the handmade pipe with an alcohol based stain. This is necessary with briar. It is fine looking wood without a finish. Finally, coat the pipe with a thin layer of carnauba wax. You can find it in auto supply stores. Check the ingredients for additives. You don’t want those. Turn your Dremel to the lowest speed and put some carnauba wax on the polishing wheel. You can go so far as to polish the pipe stem but do not put any carnauba wax inside the pipe bowl. Put some of your favorite tobacco in your pipe and smoke it.